Our specially selected, smaller, locally caught albacore are higher in omega 3's, lower in mercury, and far superior in taste. Unlike store bought fish, there is no water, soy, or vegetable broth added. For the past few years there has been a heavy emphasis by the media and anti-fishing groups on the subject of mercury in fish. There has also been a good deal of positive publicity concerning the health benefits of fish that are high in Omega 3's. 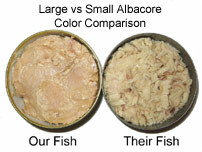 When making healthy eating choices, it is important to understand that not all albacore tuna are the same. Below is a brief guide that shows how to choose the healthiest and best tasting albacore available. Mercury is a natural element that is found in minute quantities in air, water and all living things. Some fish have more mercury than others depending on their environment and their position in the food chain. Fish absorb mercury in their gills from their environment and as they feed on other aquatic organisms. 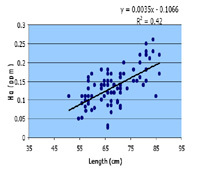 Until a recent 2003 study done by Oregon State University, no distinction was made between the mercury levels in smaller, younger albacore tuna and larger, older albacore tuna. Most of the albacore tuna sold in the grocery stores of the US is the larger, older albacore tuna that is caught using long lines off the coast of Asia. These fish are much larger, higher in mercury and lower in Omega 3's than their younger West Coast counterparts. 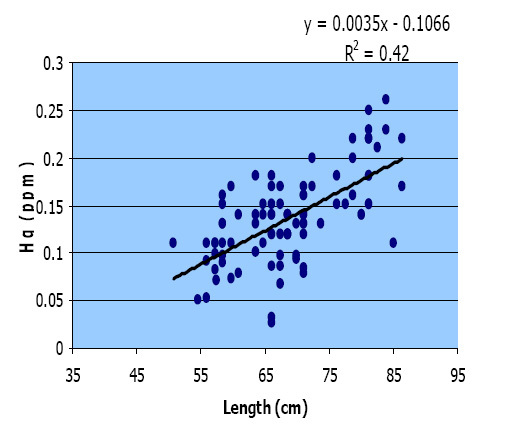 Some producers brag about the fact that their tuna are caught with long lines, and not nets. This is a description of a particular type of fishing that catches larger, higher mercury albacore. All of our fish are caught using simple hook and line, not long line. 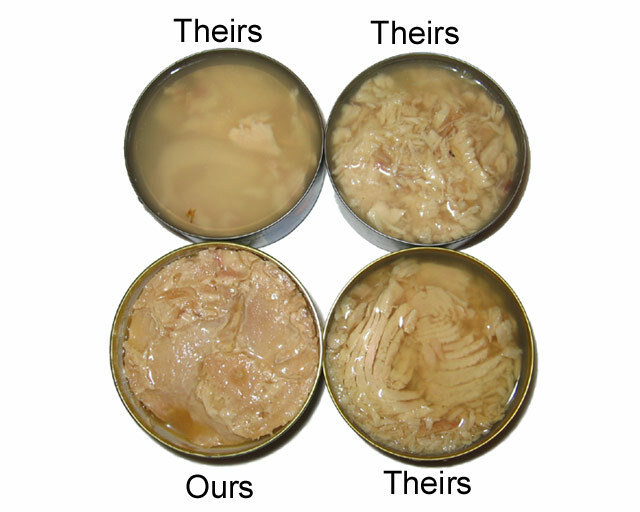 The Food and Drug Administration lists the mercury level of "canned albacore tuna" at .353 parts per million. This figure fails to account for the differences between larger, older, longline-caught albacore and our smaller, locally-caught albacore which in a recent study by Oregon State University have an average mercury content of .140 parts per million. This is less than half of the mercury level of albacore you are likely to find in your supermarket, and nearly the same as "canned light tuna" which the FDA rates at .118 parts per million. Albacore tuna is the only tuna that can be canned using the descriptive term "White Meat." As albacore tuna get older and older, the meat becomes lighter in color. 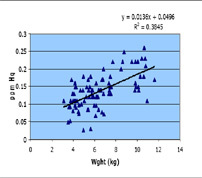 This is due to a loss of body fat, which results in a loss in flavor and a loss of beneficial omega-3's. 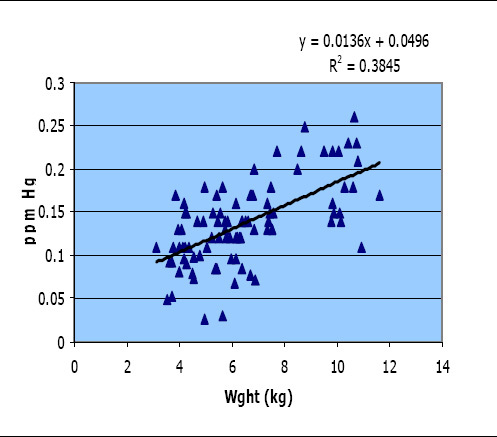 Large albacore canneries in Japan and other Asian countries export these older, higher mercury, whiter albacore to the United States because if we see "White Meat" on the label, we expect it to be white. In contrast, the younger, more flavorful albacore are actually a light beige color, with better flavor and more health benefits. The only thing you will find in our cans of premium quality albacore tuna is specially selected hand-filleted, hand-packed tuna and a small amount of salt. 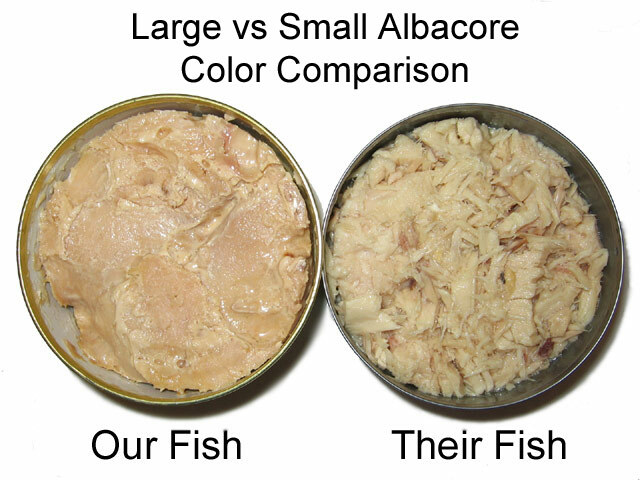 Next time you go to the supermarket, take a look at the label of a can of albacore. You will see that they add water and soy or vegetable broth. You are not buying a can of tuna. Instead, you are buying water, tuna, and soy or vegetable broth. Take a look at the photo at the left of our tuna, and three cans of albacore purchased from the local supermarket. Each has water added that you are paying for. 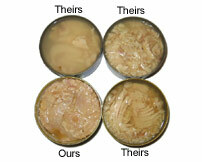 The only liquid in our can is what naturally cooks out of the tuna during the canning process. Although our price is a bit higher, you are getting more tuna for your money. Stop paying for water and vegetable broth. Not only this, you are getting healthier tuna that is far better tasting. All of our tuna is caught by Americans in the pristine coastal waters of Washington and Oregon. It is hand filleted, hand packed, and canned right here in the USA under the stringent guidelines of the Food and Drug Administration. Most supermarket albacore is caught and packaged in Asia, then shipped here. With recent problems with the food items coming in from Asia, you can have confidence in this highest quality all-American product.